Making beer is all about controlling the process. 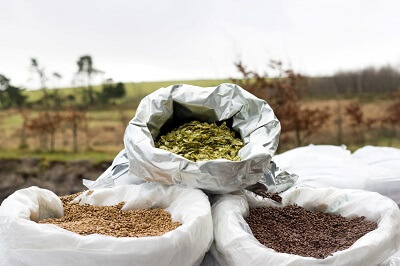 The four simple ingredients of malt, hops, water and yeast, when controlled, yield consistently good and delicious beer. 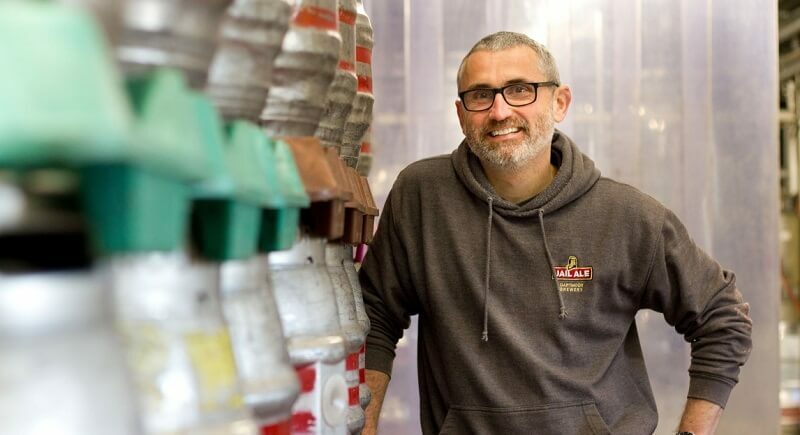 Head Brewer Ian Cobham gives us a fascinating insight into the whole process. The malt is crushed in the mill in order to access the sugars that, were they not harvested and malted, would otherwise have been used to grow the barley plant. It is this sugar that we, as brewers, are after. It is crushed lengthwise to open the kernel but not to crush it. This leaves three important parts - the husk, the starch and the flour. Getting this ratio right means all of the extract (sugars) is used and the filter bed is formed (husk) giving clear wort. The entire brewing process is a fight against protein. This filter bed is the first stage of filtering it out. 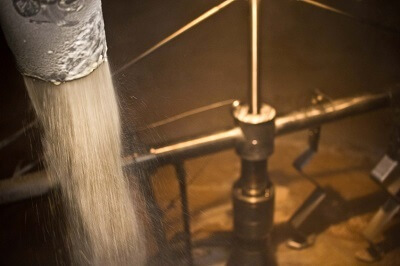 In the mash tun, the crushed grain (grist) is mixed with hot water to create a porridge where the enzymatic conversion of the starch takes place. There are many, many complex processes that occur in the mash tun but the main one that concerns us is the access to the sugars. One amylase enzyme works well at 68c and the other works well at 63c - they break down the protein matrix in which the starch is ensconced. Hence we mash in at 64.5c in order to satisfy both parameters. This conversion takes about 45 mins. During this time, the wort is recirculated through the bed to give clear beer. We then run out the wort to the kettle. In order to wash the wort through, we sparge with hot water to get all the sugar-rich wort from the grain into the kettle. Once again, the boiling process is quite complex but in general terms it yields us a stable, sterile wort that we send to the fermenting vessels. In the boil, the second major ingredient of beer becomes important. The hops are added early to give bitterness. 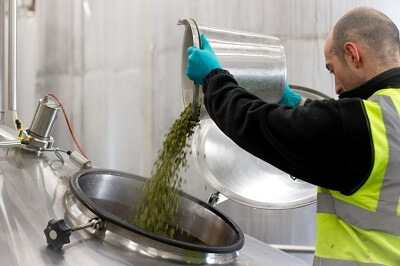 We use hop pellets which whirlpool out at a later stage. The hops have an alpha acid that isomerises in the boil into an iso alpha acid which gives the bitter backbone to the beer. Hops are then added at the end of the boil, not for bitterness, but for aroma and flavour. As they are quite volatile, they tend to flash off up the chimney so are only added at the last minute in order to capture these subtle flavours. The fight against protein continues in the boil and we add carrageenan in the copper to help precipitate out the protein. The wort is then pumped to the whirlpool and enters tangentially, which causes a whirlpool action (hence the name) and spins the clear wort to the outside and the trub (protein and hop residue) to the middle. This clear wort is then sent through the heat exchanger to the fermenting vessel (FV). The wort at 95c is cooled using cold water in a contra flow system which drops the temperature of the wort to 16c. This also creates hot water that goes back into the hot liquor tank (source of all hot water in the process). 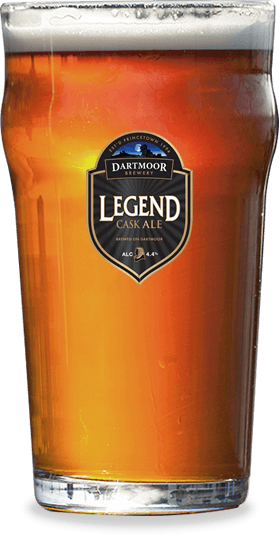 At Dartmoor, we practise cone-to-cone pitching of the yeast. This means we re-use the yeast from an earlier, finished brew and transfer it from one vessel to the other. Yeast is very sensitive and very important in the process. It has its own character and is responsible for a major part of the beer’s flavour. Ale yeast has a working range of 8 – 20c so we make sure the wort being transferred is never outside this range as it would kill the yeast and leave us with a non-fermenting sugary mess. This generally takes about three days and then a further three days of conditioning on the yeast. We then take the yeast off the beer before we rack it into casks. We control the fermentation process so that not all the sugar is turned into alcohol and CO2, leaving just enough to turn over in cask and condition the beer, giving it a slight sparkle. 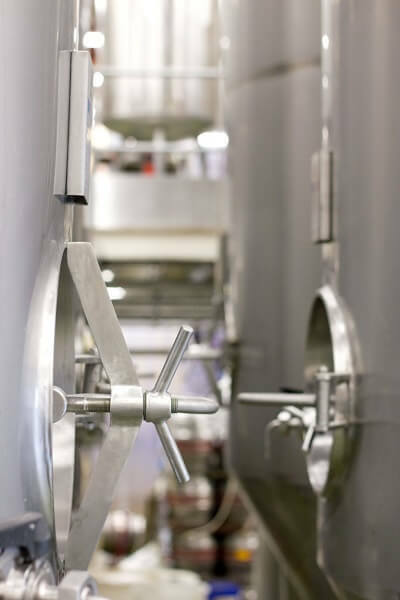 In order to get clear beer, we add two types of finings, one to take care of protein and the other for yeast. This live beer needs to settle out for 24 hours before serving. As the beer engine introduces air when serving, cask ale has a three day shelf life before it is too oxidised. Unopened, the beer conditions in the cask and can last up to eight weeks.